We say a child is as pure as God. This is because children are born with an open heart without any programming. It is raw, flawless, unconditional and without any impressions. Therefore they are able to connect with the loving energies most naturally with immense freedom of thought, positive vibrations and love without any limits. This can only be felt and is very difficult to express in words. We call it spiritual awakening which gives them unbelievable visionary powers such as telepathy, intuition etc. It is only when we grow old contamination starts trickling into our hearts. Our heart and mind get programmed in various ways owing to our interactions with people. The more we see the world, higher is the programming set into our heart and mind. Unfortunately, we make the world the way we grow in it. It is of prime importance for parents to recognize the unique gifts the children are born with and to help them grow as they are. This is without limiting their growth with worldly lessons. Children are an asset to this world. Let us understand this and raise our awakened children into awakened adults for the benefit of our society and the human race at large. All emotions are natural; be it happiness, sorrow, displeasure, remorse or anything else. For a child, every emotion has some meaning. If we try to program them that this emotion is good or that is bad, they shall not be able to express themselves properly. In fact, they will try to curb their emotions. These unexpressed emotions will remain deep inside their heart and keep seething and simmering and one day can explode in most undesirable fashion. Many times children don’t know how they feel except that there is something wrong and they are unhappy about it. We must understand that there is always a healthy way to express all emotions and that is what wecan teach our children. There is a way how to deal with it. First of all, we should identify the child’s emotion. The symptom may be different from the real cause. So we should discuss it with the child and analyse it. When the child understands it, we can then show him how to express it in a positive way so that the basic reason for that emotion is properly addressed. This is particularly true with the negative emotions like anger, shame, guilt or frustration. Out of our habit or the way we have been brought up, we keep telling our children that they are good or bad. This ‘good boy bad boy’ syndrome leads them to consciously develop a division within themselves due to which they struggle between the categories and fight within themselves. This sort of understanding plays havoc with their personality and sometimes it blocks their proper growth. As parents, we should not target our children as good or bad. It is particular deed or behaviour that is good or bad and not the child. Our attention should be on telling the child the difference between the good deed and the bad deed and encourage them for proper behaviour. Similar is the case with gender. We should not categorize what is good or bad for a boy versus a girl. Children express their thoughts and ideas in unique ways. It is for you as parents important to understand what they want to say instead of being judgemental on just their words. They have unique capabilities to perceive things. They don’t say things just to be laughed at or mimicked or discarded. As a parent, this is not appropriate. You must pay attention to what they mean to say. If you ignore the wisdom of your children, they may perhaps stop communicating with you or start telling lies. It is for you to create a positive atmosphere for an open and transparent communication with them. Children are special creations with special abilities nature has gifted to them. They know how to connect to the positive energies unconditionally. You need to spend time with your children. This does not mean that you stay with them as an adult but actually try to level yourself with them. Respond to their small curiosities; they are so humbling. This will give you an opportunity to shed all your inhibitions, your misunderstandings, your ego. You will simply assimilate with them. You will discover to your amazement how many things your child can give you. It is the unlimited pure joy you will be experiencing which you cannot express in words and cannot get anywhere else. Your child can gift you back the real meaning of life. In the process of living in this harsh world, we have forgotten and have deprived ourselves of many small things which can give us true pleasure. 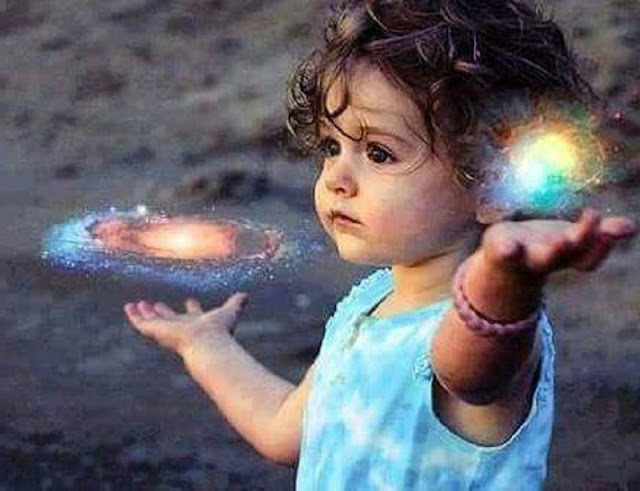 You cannot reverse your age, but can definitely rediscover yourself in your child and enjoy the elixir of spiritual awakening.